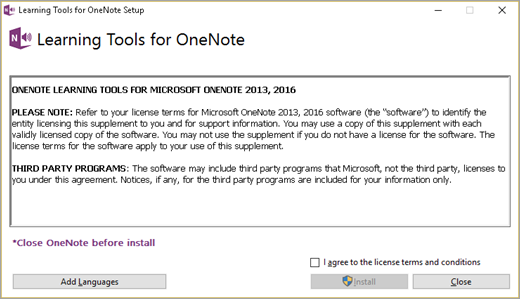 To install Learning Tools Add-in, you'll need Windows 7 or above, OneNote 2013 or OneNote 2016, and permission to install software on the device. If you need to install Learning Tools on more than one computer, follow these instructions. Dictation is not supported in Windows 7. Note: Note: You do not need to install anything if using OneNote Online, OneNote for Windows 10, or OneNote for Mac. Close OneNote by selecting the × in the top bar of the app. Download the Learning Tools Add-in. Select Run or open LearningTools.Setup.exe and follow the directions on your screen. If you'd like to add more languages for Immersive Reader features like Syllables and Parts of Speech, select Add Languages. If you skip this step, the Learning Tools Add-in will install all default languages and any available auto-detected languages. Select Restart when Learning Tools finishes installing. Open OneNote, and the Learning Tools tab should now display in the ribbon. If the Learning Tools tab doesn't display, check out these troubleshooting tips.